The five elements: Earth, Air, Water, Fire and Aether offer a comprehensive and direct approach to bio-architectural design and the creation of manmade environments. The Five Elements speaks of a holistic approach to the design of architecture, and the necessity of our connection to these primordial elements. These are then used to generate a set of design principles for the creation of harmonious and healthy architectural environments, and holds the key to creating an energetic symbiotic relationship with our natural ecosystems. geomancy, grounding, fractal bioactive materials, agriculture. water restructuring devices, water features, biomimicry, regenerative design. Air quality, passive systems of ventilation, systems integration, interior space, informational fields/prayer. Natural light, technology, coherent fractal field generators (CFFG), EM pollution. Shape power, life force, Sacred geometry, Fractal design, Bio-geometric translators. Earth = The practice of “earthing” has been shown to have dramatic effects on health, which emphasizes the importance of our connection to the natural elements. Our modern world practices have severed the essential connection to the earth element as it relates to agriculture and have disconnected conventional buildings from the earth’s energy. Food in most homes doesn't grow in the immediate environment, therefore not only is it devoid of life force due to modern non-organic, toxic agricultural methods, but it also lacks the local environmental biome, which is essential to the ecosystem that connects plants, animals and humans. The bio-architecture of the new earth paradigm will connect to the local environment in life-positive ways, promoting and maintaining the health of all beings while also supporting balance within the micro environment itself. Architecture will only integrate energetically with its surrounding environment when it accounts for the subtle energies emitting from the earth. Geomancy literally means, “Divining the Earth”. It is the art of harmonizing with the subtle earth energies that flow throughout the landscape. The naturally occurring energy grids of our living sentient earth are affected by many influences: electricity, magnetism, the time day or night, light, color, heat, sound, matter, and consciousness. The planetary energy grid operates through certain geometrical patterns. The grids meet at various intersecting points forming a kind of matrix. They are called, Ley lines or also known in ancient traditions as ‘song lines’ or ‘dreaming track’. This energetic grid and the intersecting nodes are equivalent to the Meridians and acupressure points on our bodies, performing a similar function to this energy channels, these grid points are generally found at the places of strongest power on the planet. In order to locate energetic lines and beneficial, or detrimental energy vortices on the land, specially designed pendulums or other forms of dowsing can be used. These measurements can be confirmed by geomagnetic surveys using additional specialize instruments. This information can serve to inform the creative process as to optimize the particular location in such a way that will enhance the arrangement of particular architectural features. Thus utilizing power spots to decide parameters of landscaping design, particular location of permaculture gardens, compost piles, waterways, paths, etc. All can be designed to create a coherent relationship, where all these different features will be harmoniously located for synergistic interactions with the earth’s energies. The development of human-made environments that do not connect with the subtle energies of the earth will never reach their full potential as sustainable, life-enhancing environments. Therefore, geomancy is a fundamental design principle of bio arc buildings. The conscious application of these principles in the creation of communities and human settlements can repair the damage that our existing civilization has created, with and in, this energetic network and the effect that it has upon the individual and thus collective consciousness. Or earthing, systems are concerned with balancing the electrical fields of our bodies, thus improving our health, by increasing the quality, as well as the quantity of our physical connection to the earth energies. The earth is charged with a negative electrical potential that is vital for our health and wellbeing. Connection with the earth has been shown to produce anti-inflammatory effects, increased blood flow and viscosity are just some of the many other demonstrable health benefits. Grounding has a particularly vital secondary function, whereby the presence of excess EM energy that has accumulated in the body, is grounded back into the earth and out of the body. This so-called “electro smog” can affect the regenerative process of our bodily functions, especially during the sleep restorative phase, whereby the proper functioning of the pineal gland in the production of melatonin is often dramatically reduced, leading to premature ageing and disease. Grounding has been shown to help to reverse these tendencies. can and should be used to ground entire buildings. 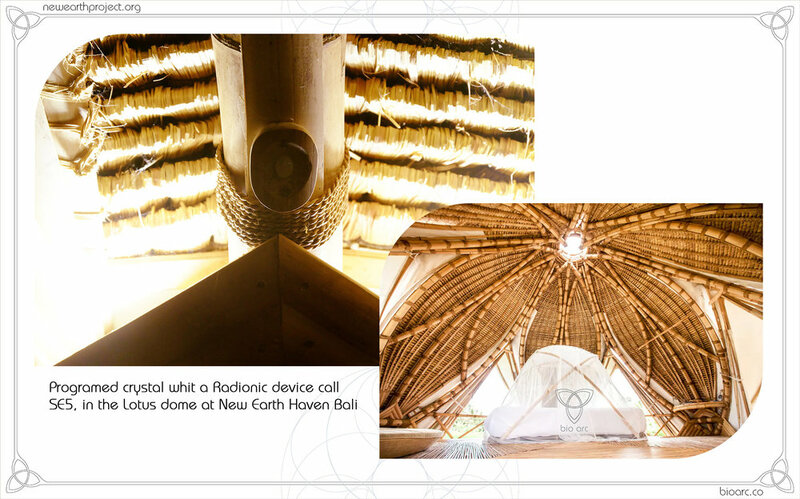 This natural phenomenon is cultivated by earthing systems described in this bio architectural design system. The earthing systems are composed of copper rods that connect into the ground and draw upon these free electrons. Through a copper geometric grid installed in the floor, a cable delivers the earth energy. Occupants of the spaces receive the amplified benefits of the negative charge emitted from the earth via the grid. Earth connection plugs will be installed into the interior of the bio domes and other structures, allowing the connection of grounding devices for beds, chairs and mats. can be designed with different geometric shapes and materials to perform the function of bringing the earth’s negative electric charge to the space and their inhabitants. At the same time within this system, is generating a coherent field, further enhanced by the earth’s energy. These restorative qualities provided by the grid system can be further designed and engineered for healing purposes by adding phase conjugate systems, phase conjugate magnetics or other electro-energetic systems. Fractal materials are materials that are phase conjugate because they have been in most cases produced by some type of natural processes. They contain an inner coherent, fractal structure make up, therefore they are able to exhibit high dielectric constants. This term is normally exclusively used in electrical engineering, and as we will learn later, there are profound implications for this in architecture. Many structures not just capacitors used in electronics, exhibit capacitance. Is interesting to note that the atmosphere is positively charged, and the earth has an opposite negative charge. Thereby dielectric materials situated in this boundary, for example a forest or a building exhibit the same electrical condition than the dielectric component in a capacitor, but on a much larger scale yet as a low energy system type dynamic. There are multiple areas of architecture that should be looked at from the perspective of an electric engineer, but they are not. Herein lies an opportunity for improvement in architectural design from which many benefits may be derived. A particular treatment in the manufacture of what are called bioactive materials, should replace the use of conventional concrete, this can be used in any architectural context, including interiors and other decorative features. This type of bioactive composite material can have a profound effect and change the energetic quality of a building dramatically. From a purely physical/chemical level, we highly recommend avoiding Portland cements as binders, particularly in this energetic approach to architecture. When cement is heated up to 3,000 degrees this process creates a missing, unstable isotope which gives it an unbalanced positive charge. Cement made in this way draws electrons out of anything with an opposite charge which is in close proximity, including people, animals or plants, this can cause chronic fatigue. Furthermore, concrete out gases, thus creating more opportunities for toxicity to be introduced into the living environment. These are mostly derived from the additives included in the mix and other sources such as mold derived from concrete’s tendency to attract moisture. Magnesium based cements and other geopolymers that represent much more bioresonant choices. Also, the dielectric constant of these types of materials, which haven't been exposed to high temperatures, are much higher. Rock powders with paramagnetic properties like basalt and lava rock aggregates or other similar materials are the prefered options. Many other possibilities exist within in the recipe of these bioactive materials, including the addition of natural fibers to add strength and high dielectric properties. In addition there is the natural radiation mitigating properties of cetrapitetal field effects of the bioactive materials themselves. This effect will also be enhanced by applying the golden mean frequency cascade produced by golden mean frequencies used in the curing process which energetically optimizes the internal coherence of the materials. Polarization and direction of charge flow in the curing process should also be taken into consideration as to the position of the components in the actual building morphology, its location, alignment and direction with in the magnetic fields of the earth or/and upwards. Metal rebar should also be avoided not just because it reduces the longevity of the buildings (look at concrete cancer cause by iron rebar) but also because metal rebar augments the magnetic fields and acts as an antenna for incoming EM radiation increasing the electromagnetic pollution of the environment. Bamboo rebar or other type of natural fiber are perfectly bound with magnesium cements and as such are the preferable options. Is a system that attracts and accumulates Orgone energy or life force from the environment, as proposed in the original work by Wilhelm Reich (in the 1930s), using containers made of metallic and non-metallic materials acting as a implosive capacitor for dielectric charge. According to Reich’s experiments (with what he called Orgone energy), organic and non-metallic materials will attract and concentrate Orgone, while metallic materials will attract and immediately reflect it. Viktor Schauberger, who described how this energy could travel through organic non-conductive mediums, just like its phase opposite electromagnetism, as he calls it “dia-magnetic energy”. Later it was referred to as, fractal dielectric capacitors, by Dan Winter. These principles were used in the temple buildings of antiquity. For example, in Egypt one can see in the energetic morphology of the Great Pyramid of Giza, that the main body of the pyramid is made from stone with a high level of iron oxides, which is responsible for the yellow color and in part for the paramagnetic behavior. A dia-magnetic layer of white Tura limestone composes the outer layer, (this was mined by other cultures and now remains on the top section). The inside of the tower chamber of the Great Pyramid is constructed from pink granite. Phillip Callahan’s research into para-magnetism revealed pink granite as one of the highest paramagnetic stones. When we compare these similarities with how these layers are organized, the flow can be directed inward or outward. This can be seen as a parallel effect produced by zebra stripes; the changes of temperature and density on the zebra surface produced by the black and white contrasting regions produce a passive air flow (called ‘zebra effect’) or low and high pressure in weather or aether systems. This effect of layers and alternative surfaces with opposite qualities has similar fluid like dynamics. This effect is also used in the structure of all biological systems, which are in a sense living, dynamic sacred spaces. Water = Water attracts the lifeforce, or chi energy, when flowing in its natural pathways. Our world’s water sources are heavily depleted energetically, as our water is full of chemicals. Water is the lifeblood of our environment and thereby of our communities. We acknowledge its profound connection to the aether, being the bridge to life, which is why we honor water’s inherent nature throughout our designs. It is well documented that the presence of water bodies have a beneficial effect upon health and wellbeing. It is said in the art of Feng Shui that water attracts chi. Places where water flows have higher concentrations of negative ions which exhibit healing and consciousness enhancing properties. These properties can be amplified by the use of water restructuring systems, which generate highly charged water, the presence of which energizes the environment in which the water is present. Can be described as a type of state of water, in which the clusters of molecules are in a condition of high coherent order, in which the structure of these clusters is in a geometrical equilibrium, adapting different, metastate type dynamic structures, mostly linked to tetrahedral, dodecahedron, icosahedron and other related complexes of polyhedral. This is the cause of the physical decrease of surface tension, making the water more hydrophilic more absorbable by the body. Restructured water also binds more oxygen and imparts a negative charge know as zeta potential, conductivity increases and viscosity and surface tension are decreased, which when consumed, increases blood fluidity. Similar beneficial effects will take place in plant life. play a special function in the design and energetic quality of the space. Water is a living element that is intimately linked to ether, in fact can be seen as the gate and access to the aether. As it plays an intrinsic function in all biology and is also found as an important component in some of the most ancient temple design of the antiquity, including the Giza pyramids. Water ponds and rain water collectors are an intrinsically important part of the bio-design concept while also performing a functional aspect of collecting water that will be used in different areas and for different purposes. Water also becomes an important energetic aspect of the design; concentric rings of water have an energetic effect that generate life force, (as a water type Orgone accumulator), and can be beautifully integrated in the design of the landscape. Use of specific shapes to contain and store water can be selected to maintain and support it's energetic function. Shapes that are connected to the molecular structure of water can energize water thus creating morphic resonance effects. The shape of the water pipes used on the buildings should be energetically optimized to create a torsional motion in the interior of the pipes while straight lines should be avoided where possible. Water structuring devices can be designed in such as was as to be integrated in the interior and serve as an energetic decorative feature but also as a means of storage in which the water is constantly treated, and easily accessible to drink by its inhabitants. This is all consciously designed with intention to create a healthy harmonic relationship with architecture and the element of water. Development and construction has almost always been seen as inherently destructive of nature, what if we could turn this around 180 degrees? Not just to minimize the footprint and environmental impact, but to also have a regenerative effect upon the environment. Establishing a symbiotic relationship with its surrounding environment and micro climate. The entirety of this article explains, in a deeper sense, how this can be achieved by energetic effects produced by the coherent combination of these subtle energy systems. Therefore, in the applying of these solutions we will maximize the effect of shape/energy and fractal geometry and provide a deeper explanation of the aether element; and the effects it has on the regenerative process, by allowing this energetic design to support and activate life force within a particular given environment. This geometric energetic design system approach can be used in a scenario where the land has been cleared of trees and other plant life. 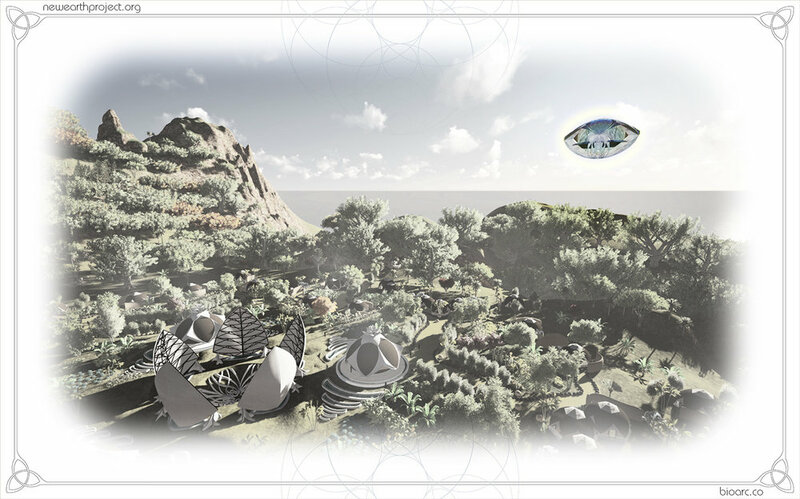 In such circumstances, we will use a form of energetic blueprint and design concept, that will have a regenerative effect within the particular location, calling life force back, inducing rainfall, inviting animal species and plant life to return, which will restore to its natural a state of equilibrium. There are many tools that can be used to create this effect, one of them is shown is the layout of sacred mandala/yantra like geometries, which have been demonstrated by an experiment with the use of geometry such as the Sri Yantra, constructed with paramagnetic stone in the desert of Oregon by Mickey Basin which was consequently replicated by Dan Winter finding the same regenerative effect. These design principles are able to reintegrate man made environments in to their surrounding natural ecosystems in a symbiotic relationship; revivifying those ecosystems through regenerative principles. This approach can also be significantly enhanced by the use of CFFG technologies based on life-force or scalar/torsion energy. Their regenerative properties are measurable field effects capable of enhancing growth, regenerating biomass and restoring environmental equilibrium. These technologies are regenerative design systems and combinations of bio-architectural principles, which can reverse entropy, enabling the creation of a profound regenerative effect upon the environment. The principles of integration and regeneration are key to establishing a thriving relationship between nature man, his environment and the activity of architectural development. Both systems can be used to different degree respectively, resulting ultimately in the creation of a system that integrates and regenerates... creating a thriving, sustainable human settlement in correlation with an existing natural environment. This concept is firmly grounded upon the principles of bio-architecture, permaculture and syntropic agroforestry. both design systems are the key to building living ecosystems in harmony with the natural environment. In terms of the design approach, this system mimics the way a tree will dig its roots into the earth while at the same time reaching its branches up into the sky. This extension demonstrates the perfect distribution of energy to maximize the space and the ideal exposure to light, also call phyllotaxy. We utilize this natural principle to configure the distribution of structures into the disrupted ecosystems in order to reduce environmental impact. This concept of integration is also a philosophy of action, where the path of less resistance is the solution for maximize integration and reducing the final energy/work requirements. “Be like water my friend,” Bruce Lee. By imitating natural processes and forms, one may create man-made environments which co-exist harmoniously with their surrounding environment. Over the last 3.6 billion years, nature has gone through an evolutionary process that has generated a high coherence of self-organizing biological systems that thrive in perfect harmony and equilibrium. Bio-mimicry is the art of discovering the natural processes which have driven this remarkable feat, and employing them to create fully-integrated man-made environments. The outcome is aesthetically pleasing, life affirming and supportive of those living in and amongst the dwellings, as well as being harmonious with the natural landscape. Each individual building and the formation of the cluster of buildings imitates in different ways the innate beauty and efficiency of biological systems. Air: Air quality, passive systems of ventilation, systems integration, interior space, informational fields/prayer. Air = Space. The quality of air is very low in most modern buildings as they create an oxygen depleted environment. With the lack of plant life and mechanical heating and air condition systems there is also a deficiency of negative ions. This also relates to the quality of space itself, like apartments which are very confined. Ancient knowledge did not consider air as gas which is a very recent materialistic development, but rather as a living emanation from the higher realms here to sustain our lives. Air quality and the presence of negative ions and appropriate levels of oxygen content in our air, are crucial for health and wellbeing, most would agree that this is one of the most important hallmarks of a healthy environment. Science has now demonstrated how health and longevity are dramatically improved by the quality of air we breathe. Stationary adults typically inhale six to 10 liters of air every minute entering in each one of our cells. The components and energetics of this air are absorbed by and actually together with the food we take become our body, serving many biological functions. For these elements to be in natural harmonic state is therefore fundamental to our health and wellbeing. The air in a room should be frequently renewed and it is relevant to note that artificial systems of ventilation (such as air-conditioning) degrade the presence of negative ions and reduce the presence of capacitive charge. Using passive systems of ventilation where natural airflow is encouraged through the creative and intelligent design, has no such negative effect on the presence of negative ions and, if done properly, will deliver all the quality fresh air the human body could ever need. Systems integration describes the process of ensuring that all components of a man-made environment, from their infrastructural systems of power, water collection and distribution, waste treatment systems, food production, hard and soft landscaping, and the internal systems of buildings themselves operate as one integrated system; each serving a common purpose beyond their own function and each enhancing the efficacy of the other systems. A man-made structure is really a generator of space. We do not live in structures; we live in the space which is created by them. The structure is simply the membrane, which defines its boundaries. When the principles of natural design are properly understood and applied, a man-made structure is itself a biological membrane, much like a cell wall. Just like the cell wall, a man-made structure is responsible for maintaining homeostasis, such as the balancing of conditions and management of the exchange of elements between the inner and outer environment. This includes the energetic component like the connection between heaven and earth. Space also relates to the functionality and the use of the space itself. The design and practical distribution of different areas and their functions are an integral part of architectural design process. These are the things that will determine and influence the flow of human energy within the space provided and are also a primary consideration of BioArc Designs. As we increasingly spend more and more time indoors, the ability of a man-made environment to fulfil our needs and influence our lives becomes increasingly important. Interior-space design must become purposed toward the regeneration and health of our bodies, along with the harmonization of our psyche toward being a positive influence on our interactions and relationships, as well as the healthy movement of our bodies. This will enhance the efficiency and efficacy with which we expend our energy in our daily activities. This concept of how subtle energy has this intrinsic formative nature being the creative principle, the life principle, as abstract as it may sound, is, in fact, used in a form of modern technology known as “radionics” which in many ways have materialy demonstrated the use of these principles in different forms of energy medicine, healing and other applications. This phenomena is also demonstrated by Russian sciences and by a wide range of experiments on the informational field nature of “torsion fields.” This has also been described by the pioneer Nikolai Alexandrovich Kozyrev and others of his contemporaries. They discovered how this subtle energy/information can be applied and affixed to an object as a meta-state, and particularly in crystalline structures, having geometric configurations of tetra-octa-cuve Crystal lattices, which give them the ability to store subtle information. Similar principles are used in homeopathics. There are also an innumerable number of other applications for healing, space and the particular applications in the practical conversation of architecture. In the harmonization of spaces, it brings in to the design of space, the use as a qualitative/generative energetic system that energetically inprints in the architectural environments. This field of subtle energy/information can then be in-printed in to crystalline structures. These features can be place in geometrical arranged crystals along the spaces, which can be pre-programmed or remotely programmed via morphogenetic field resonance, just as is performed in radionic healing therapy. Subtle Information fields are just one more example of the multiples innovations and potential applications of subtle energy. Fire = Light and warmth. Scientific studies, such as those by John Ott, point to the importance of sunlight, and its full spectrum as essential to health and behavior. Two thirds of the energy required for cell function comes from light. Long-term lack of exposure to this most fundamental source of energy has several adverse health effects. The play of light for optimum health and activity is essential to our designs. Warmth is more than just heat; it is the regulation of our biological temperature range, thus our design goal is to create stable living conditions for each environment they are designed for. The presence (and absence) of natural light is responsible for generating the sleep/wake cycle. The degree to which we synchronize with this natural cycle can affect the efficiency of our digestive systems, the stimulation of Vitamin D production and influence our emotional state and other body/mind processes. The effects of light upon the human body depends upon the light’s wavelength, intensity, and exposure duration. Most of us spend the majority of our time indoors, often in excess of 90 percent. As a result, we are invariably exposed to unnatural forms of light which our bodies have not evolved to deal with. The effect becomes much worse if the exposure to artificial light continues past sunset, as this disrupts the circadian rhythm and prevents the production of melatonin (one of the most potent anti-aging chemicals) by the pineal gland during the sleep cycle. It has long been known in the Vedic culture, and practiced by yogis themselves, that light can become our exclusive source of food/energy. Such an insight speaks clearly to the importance of our connection to this element, and to the sun itself, at the physical (light) energetic level (subtle energy longitudinal EM). Translating this into the practical conversation of architecture, we need to fully consider these principles at the outset of the design phase, ensuring that ideal levels of natural light are realized in the completed space. This may be as simple as providing adequate windows or skylights etc. which allow natural light to penetrate in to the interior space, or may require the specification of electric light systems which include filters that eliminate the blue component (which is the principal component responsible for disruption of the Circadian Cycle). Such systems become considerably more important to maintaining optimum health. We can define a Coherent Fractal Field Generator (CFFG) as a system or technology that produces a field effect; that will generate coherence, fractality, self-organization, implosion, love, harmony, healing and therefore enhancing and harmonizing all of life. The Agnihotra Fire Ceremony is one of the most potent examples of CFFG which can be a key to understanding the precision and potency of the sacred sciences. This ancient Vedic process utilizes the energy produced by Phase Conjugation of the earth and sun’s magnetic fields, which occurs twice daily at the precise moment of the sunrise and sunset, by burning specific organic substances in the pyramid of a specific size and shape is a type of phase conjugate, Longitudinal EMF antenna. This ceremony/process can produce profound effects in the surrounding environment including accelerating growth and fruitfulness of flora and fauna as well as reducing pollution and radiation in an unprecedented fashion. The scientific case for Homa Therapy and its core practice has been carefully documented and collected by the Homa Therapy International Network. This daily practice can be seen as holding the keys to a better understanding of sacred space itself which is in a very real sense the creation and maintenance of neg-entropic fields. For more information, download the book by Robert Bagnall, entitled “The Ancient Solution to Modern Pollution”.
. This non-dual, neutral state is generative and regenerative and may be seen as feminine in quality as the source, but is non dual and beyond space/time. Paradoxically, this state is able to give birth to all forms, as ”the mother light” of the tibetan dream Yoga, this is the state in between, is the un-manifest force or aether that precedes all manifestation. As an example, when we establish two opposing phase conjugate magnetic fields they cancel each other out, seemingly defying the laws of physics as energy can neither be created nor destroyed. Therefore, there must be another form of energy created in this process. We call this “scalar” in mathematics represented by +1 -1 = 0 as mathematical conjecture will assume, but in opposition these fields contain all the potentiality of form as in “form is emptiness, emptiness is form,” The Heart of the Perfection of Wisdom or The Heart Sūtra. In the words of Dale Pond author of Sympathetic Vibratory Physics: The neutral state or “place of voiding" is the causative state of either the expansive or contractive. These two active states then are the effects of the cause. These two states are the active physical or 3D world”. “Male and Female Forces will intermingle from which unition results in a third manifestation, or the initial stages of manifestation of that which bears parts of each” “there is also a neutral phase or state occurring between or at phase shifting loci (fulcrums). ‘The ether is not really a "physical" thing but more like a liquid light…”. In The Steiner tradition the concept of “counter-space” in which biology and nature’s formative fields operate, as in an omnipresent qualitative nature, a form of instant communication, that leads to the absolute synchronization of all Life and the cosmos. Being that life is a product of this state of transcendence. Considering these concepts, let’s look at some of the effects that this natural has on the biological organism in reversing disease, mitigation of cancers and the rejuvenation that is possible by the “Priory Device” and other energy medicine devices like the Theraphi by Dan Winter. Miraculous healings that occurred in sacred chambers, the mitigation of radiation and chemical toxicity enabled by daily performance of Agnihotra and other Homa Therapies, the spontaneous healings performed by the Masters and the Saints become understood in the light of this energetic principle, wherein a previously healthy and balanced state of existence is created, returning to its previous state of order and organization, the original/source form. Just think a bit deeper about how we can regenerate and heal our world with this knowledge. 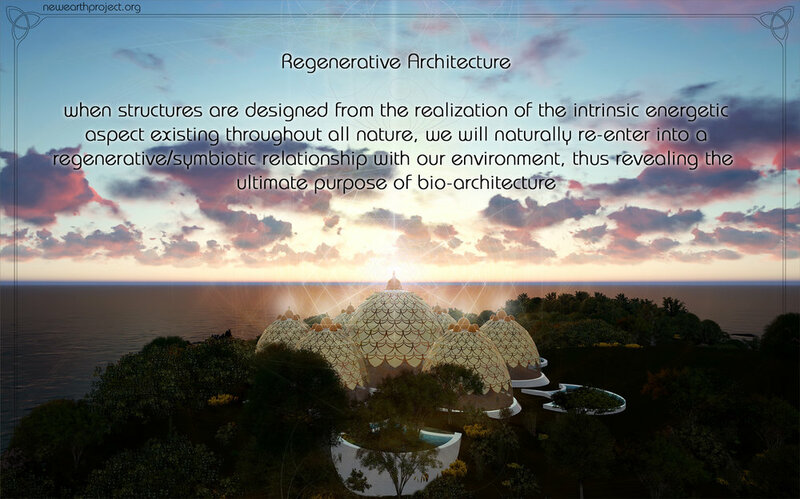 To incorporate these technologies into the design of architecture and integrate them with the energetic fields of the structure and other components of the architectural design, is the art of energetically optimizing the creation of a symbiotic regenerative relationship with our environment and thus fulfill the ultimate function and goal of architecture. The implementation of a free EMF grid by having different systems, such as low voltage DC for lighting or also be changed to other biofriendly frequencies, and EMF shielding of AC cables, are ideal to reduce the EMF pollution output of all the electrical systems within the structure. Also, shielding electrical components such as leaking transformers, using a Faraday Cages to eliminate the EM noise, this and other design methodologies must be applied in order to create a more energetically beneficial, electrical design in bio-architecture. Will have profound implications for architectural development, as they will change the way we conceive of and create architectural design. One of the key ideas here is decentralization at all levels. To help describe this and its many implications, let’s think of human settlements. If we look at what is implied by the decentralization of power generation by the implementation of free energy technologies, a potential source of unlimited clean energy could be made available in this architectural framework. Another example of a revolutionary new potential technology would be anti-gravitational technologies which could replace roadways and other long distance travel facilities. The decentralization of the production of food by highly productive agricultural systems that produce, fresh and high quality foods by: cyntropic agroforestry, permaculture and aquaponic systems. The decentralization of healthcare by the possibility to access a “true” holistic healing systems, by the introduction of advanced energy medicine technologies and other practices that focus on prevention and maintenance of health. With an emphasis on health, herbal medicine gardens will be also built into our architecture. Just imagine how these architectural improvements could transform our collective human experience in so many ways that we would not look back at present day circumstances. Think how wonderful the places on earth we could potentially live in and feel the spiritual development that could be attained in these kinds of spaces, for individuals as well as for humanity as a collective. Aether: Shape power, life force, subtle energy, sacred geometry, fractal design, Biogeometric translators. Aether = Higher space, subtle energy, that mysterious quintessence whose existence is denied by the materialistic paradigm, yet still so essential to the qualitative aesthetics of life. Modern concrete steel reinforced square buildings not only create discordant subtle energy fields but also are heavily loaded with electrosmog EMF pollution, the byproduct of the overuse of metallic structures and heavy electrical systems. Imagine the antithesis of this, wherein our living spaces the optimal balanced presence of this primordial quintessential life force is in harmony with our human-made environment. Many ancient cultures have understood the principles of subtle energy and their relationship to shape or form and how specific shapes can create field effects that have a beneficial influence on consciousness and life. One such shape very well known today is the pyramid structure. Many experiments have been carried out demonstrating its effect on life. One of the most extensive studies was performed by Russian pyramid researcher Alexander Golod who found many other influences are taking place in the presence of the pyramid energy field. Some of the most relevant being the improved regeneration of tissue, the increasing of agricultural yields, the improvement in the Immune systems of biological organisms the and mitigation of radioactivity. Physicists have observed significant changes in superconductivity temperature thresholds. As an example water inside the pyramid will remain liquid to minus 40 degrees Celsius but freeze instantly if jostled or bumped. We could simply argue that these effects are not exclusive to the pyramid energy but are the characteristic effects of the life-force itself, and therefore are the energetic expression of all natural design. Suffice it to say that many other shapes can create similar and a variety of life force/regenerative - energetic qualitative effects, that can be purposely applied to specific architectural designs. This is what is meant by energetic biomimicry which lies at the heart of the Bio arc design. Another example are the specific energetics of dome structures. In the work of Victor S. Grebennikov, he referred to the cavity structure effect, CSE. He describes how a particular type of beetle used this dome structure to create an anti-gravity effect. By utilizing the resonance generated by a grand number of dome shaped cavities in the composition of the microstructure within their wings produces an amplified CSE. This can be understood as the act of cavitation within a longitudinal resonator just like a cavity will do with sound energy, or as a parabolic reflector, has the ability to concentrate light. This phenomenon has been widely studied in torsion field theory whereby torsion, or subtle energy, can be reflected by mirror like surfaces. Contrary to conventional belief this energetic vortex can be easily felt and measured by triggering the movement of a needle suspended in a vacuum insulated by an EM shield creating a sensitive torsion field detector. This may also be measured through the use of pendulums that can detect the particular qualitative property of this energy similar to what we experience with dowsing in the so called vibrational radiesthesia. In bio-architectural terms, an egg-shape is a spherical biological capacitor and as such is a structure able to generate a fractal phase conjugate dielectric field connected to all biology and self-organizing forces. We can realize how this implosion-point of ether/charge at the center of this structure forms an intrinsic part of the energetic quality of all living organisms and all biological systems. Any structures that we create incorporating such a shape or “cavity” will create this effect (when building with the appropriate fractal material) and therefore it shall be highly bio-resonant to all life and consciousness, forming one of the most preferred shapes for sacred architecture. “If lifeforce equals the ability to attract and self-organize capacitive charge – It now becomes possible to outline the function of architecture. One reason architecture should look like biology is that biological structures have discovered through evolution the materials and shapes which allow the electrical fields we call life to converge into self-organization and self-awareness,” Dan Winter. Is the primordial language of creation, the geometry of light – energy-information codes that underlay the reality matrix and give birth to all forms of life that emerge from this self-organizing force. When these principles are used to inspire human creative design processes, a resonance is established within this field that generates consciousness, life, coherence, equilibrium, and harmony. When these principles are applied diligently to the creative pursuit of architecture, a tangible effect is achieved that supports the building’s inhabitants in directly experiencing these life enhancing effects. However, every shape has a particular quality of energy. When we understand the energy attributes of shapes, we hold the key for creating the energetic qualitative optimization of the architectural space that we are working with in such as way which will support human biology and the planetary biosphere and consequently the whole of life. This ancient science, which has its roots in ancient Egypt, and the ancient galactic cultures, considers the whole spectrum of energy. This includes subtle energies which have been shown to interact with, shape itself. This phenomena has also been widely investigated by Dan A. Davidson, whose findings have shown that shape is able to generate subtle electrical fields. The essence of how geometric patterns can influence subtle energy is not a new concept. In the context of the modern age, the myriad of human-made antennas, which cover planet earth, similarly capitalize on the properties of geometric shapes, which use the phenomena of resonance in order to transfer signals (energy) to your computer or mobile phone. These are high energy systems used in EMF antennas and are generally very detrimental to humans and all biological life and, in fact, the entire ecosystem. Interestingly, this phenomena does not only take place in our technological devices, but also appears in a subtle energetic form in natural and biological systems, furthermore this was also used throughout the ancient world in temple design and it this technology which the ancients knew and understood, the technology of the life energy. Professor Philip Callahan suggests that religious structures throughout the ancient world were finely tuned dielectric antennae which collected energy from the sun, the earth and the cosmos and then passed it onto the meditators, religious practitioners and the environment around these temple structures. These constructions have dielectric (insulative) properties, and are able to receive and store incoming cosmic energy. The physics of dielectric systems is extremely complex. However, they can be formed into tubular or rectangular waveguides to collect and direct energy in the same manner as a metallic radio or TV antenna. The size of antennas determines the length of radio waves with which they are able to resonate. According to Callahan they are collectors of cosmic radio waves of a few metres magnitude. Philip Callahan also describes how trees and forests are a perfect example of this type of Dielectric antenna, operating as a low energy system and low frequency ELF, by which they are able to tap in to the Schumann Harmonic Cascade, this in fact determines the health of a tree and the health of an entire ecosystem. This understanding has been further developed and expanded upon in the study and work of Dan Winter. The challenge and question is how do we extend this out from forests and trees to include our own buildings, and our own bodies. Thereby, the full understanding of how shape and energy correlate and interact is a profound subject, which will allow us to engineer and generate the subtle energy landscape of our own architectural environment. served in the creation of this energetic. It will serve in the holistic harmonic combination of all these components, therefore in this context, the conception of art must be transcended in it’s material aspect, to the realization of its deeper function, in the creation and harmonization of subtle energy fields. this concept of shape resonance can be applied to the principle of fractality were by in a particular design you can find the same shape in a multitude of scales (scalar). The internal shape resonance of form at multiple scales and specific proportions like the golden mean, is used in temple design throughout all the ancient world. Another fascinating idea that correlates to this, is the phenomena that when this principle of fractality is used in active antenna design, a holographic field effect will extend beyond the physical antenna creating a virtual projection of this recursive pattern, just like heterodyning frequencies will keep generating new derived frequencies that will add and multiply into infinity. We can generate this phenomena in which the same principle is applied into the design of a passive longitudinal-fractal-shape-resonator, that uses specific proportions in a geometrical generative-iterative patterns, creating this type inner form/resonance. This has a particular effect when golden ratio or golden harmonics are use in the proportions of the design for the specific geometric properties of this ratio as it has the ability to add and multiple constructively (this is explained beautifully in Dan Winter’s many works). Also, the resonant relation of multiple elements and their resonances, is used in the wings of the beetle to create an amplified CSE which were also used in ancient temple design to create an amplification of this effects. Fine tuning the cavity structure and their recursive elements (longitudinal fractal resonator) of the buildings specific forms and shapes, for ideal optimization of the “dielectric coupling” to earth Schumann frequency cascade harmonics, therefore acting as a dielectric antennae is fundamental to the creation and energetic optimization of sacred bio architectural design. These specialized devices, designed by Trevor J. Constable for weather engineering research, use specific arrangements of materials in geometric form. There are no chemicals or electromagnetic energy involved. These small passive units, when appropriately used, can effect large scale beneficial atmospheric changes. These devices herald a new technology which can be a critical component in the regenerative approach by combining permaculture and cyntropic agroforestry to regenerate entire ecosystems and consequent creation of agricultural gardens. These devices were designed using specific geometrical forms and ratios and they are evolved from the Cloudbusters of Wilhelm Reich. Their interpretation adopts the idea of the aetheric formative forces delineated in Rudolf Steiner’s Anthroposophy, creating new series of devices and different systems that don't have the necessity to be grounded to water as the original Cloudbusters. Now the geometric forms and their placement are able to engineer and alter the aether concentrations in the atmosphere, and as a direct consequence the cloud formation and weather patterns. We believe the technology involved in these devices can be integrated in architectural design projects like in this concept. Thanks to the D&D faculty of the New Earth Project. For their collaboration in writing the 1st edition of this paper and to others especially Thomas Brown, Robert Bagnall, Sacha Stone, Greg Paul, Peter Juhasz, Don Paris…. and few others along the way how inspire this document, and ultimately to the intelligent infinite = collective consciousness = morphic field = akasha = aether…..
16. The Torsion field and the aura, by Claude Swanson. About the Author Juan Schlosser. Juan began his work at a very early age, being heavily influenced by the artistic Inquietude that permeated his childhood home. He explored a variety of artistic expressions such as sculpture, photography and design… which then merged into land art, and after continuing with the same concept, went on to build large-scale installations, set design for festivals and architecture. The theme of his work is always the same: Nature: energy in all its forms and manifestations. Juan’s has extremely diverse experience with sacred geometry structures through the use of patterns and forms found in nature. Taking after his father – the renowned Austrian sculptor, Adolfo Schlosser, he has developed a touch for merging beauty, art and space, creating energetic environments. By taking inspiration from natural forms and the generative geometry that permeates all things, he has developed a language to his style. Juan has become known for showcasing the vast and varied benefits of eco-architecture in a varied range of schemes including domestic, eco-concious resorts in Bali, art galleries in Europe and music festivals the world over. By using a variety of building techniques associated with the natural materials he uses in his work he has developed a signature style which reflects his interest in bio-architecture and the relationship between structure, shape, sacred geometry and the dynamics of life-energy. For the last 7 years he has been one of the central figures in the design and creation, of the architectural language adopted by 'The New Earth Project'. He thereafter founded the architectural design firm, Bio Arc, with the intention of continuing and expanding the vision of bio architecture as a medium to redefine architectural practices and contribute to generating a scientific design basis to creating a regenerative architectural system. With the help of artisans, designers, producers, thought-leaders and influencers, in addition to his friends and family, Juan’s goal is to share these concepts and ideas with the purpose of contributing to a brighter, more environmentally conscious future.